Designer Paola Navone (one of my favorite designers!) 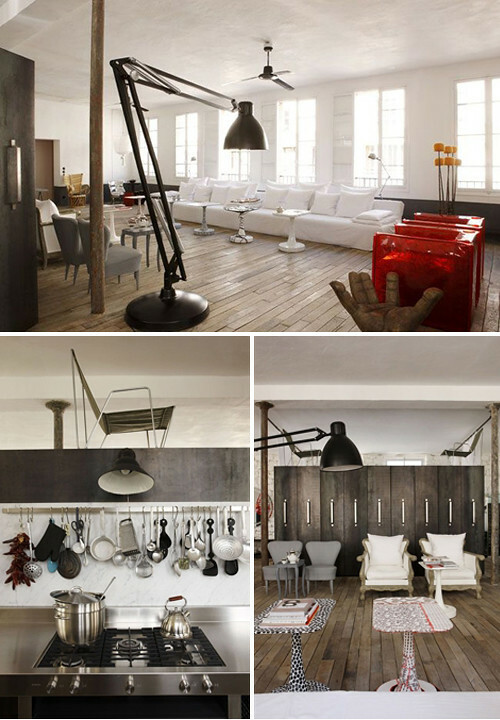 has transformed a loft into a summer house in the heart of Paris, France. The designer has played with light and contrast in this large space. 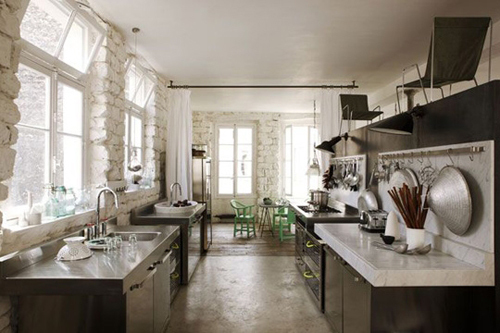 The stainless steel kitchen cabinets and appliances make a beautiful contrast with the whitewashed stone walls. A white canvas curtain separates the kitchen from the dining area. The rectangular table was made from planks that were painted gray and then drilled and stitched together with red string. Chinese chairs are painted in a beautiful shade of green. Paola designed the huge white couch “Marocco” (top image) for Casa Milano. The white curtains in the bedroom (image below) hide a dressing room. 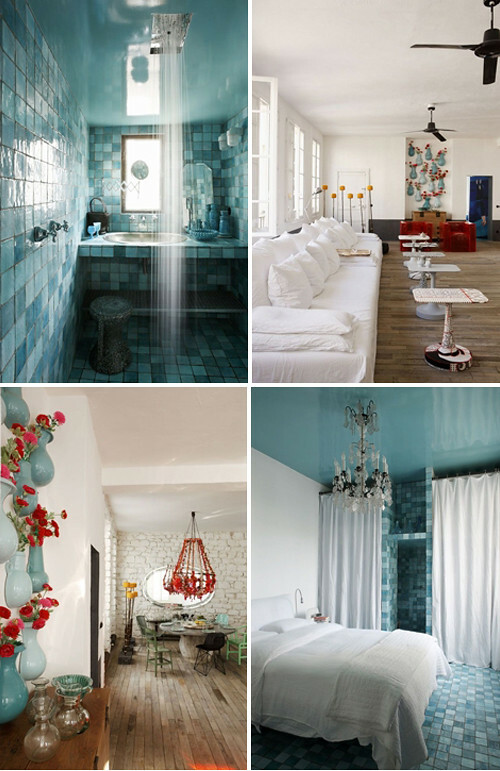 I am loving the tiles in the bathroom and bedroom: such a gorgeous shade of blue! Amazing post!! Creative decorating at is best!!! 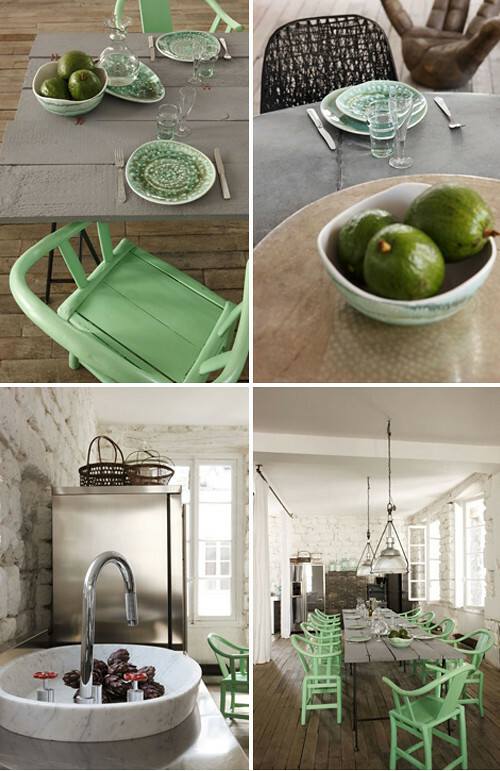 Bright mint green against all those “greiges”…an unusual color combination, I like it! Wow. Beautiful. Hard to believe that it is in the heart of Paris. What a beautiful home. That oversized lamp is exquisite! such a beautiful house – love the bathroom. This looks wonderful!. Great presentation, great post. Thanks for sharing your ideas. i think i’m in love with that dining room picture. it’s perfection! The shower/bath is to die for and the wall with the flower vases filled with the red flowers is gorgeous. This is a dream home to stay in while in fab-u-lous Paris!! If I am ever lucky enough to have a summer home in Paris, please, please let it look (even) remotely like this. This is the home of my dreams! The kitchen, the green chairs, the red and turqoise color combo… ooohhh! And in the middle of Paris – can it get any better?